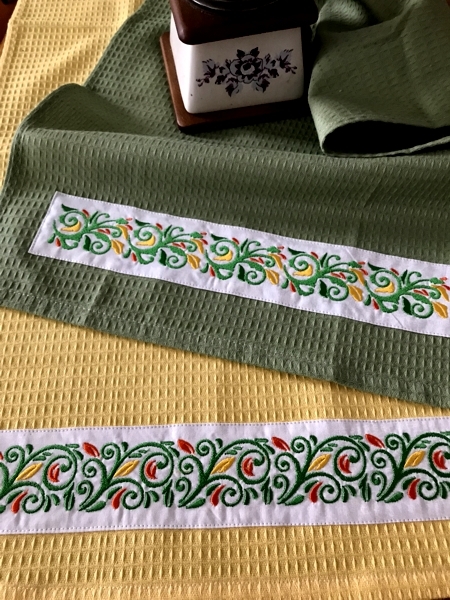 We all love to embellish household items with embroidery. 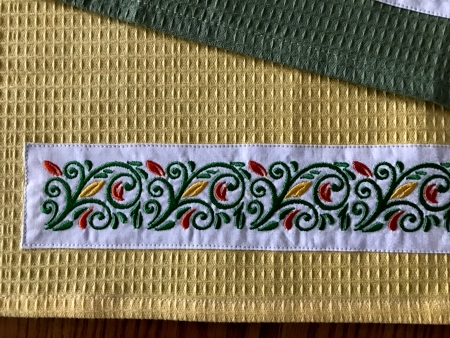 However, embroidery directly on the items can be risky: if your machine makes a mistake or the settings are incorrect, you can ruin the whole item. 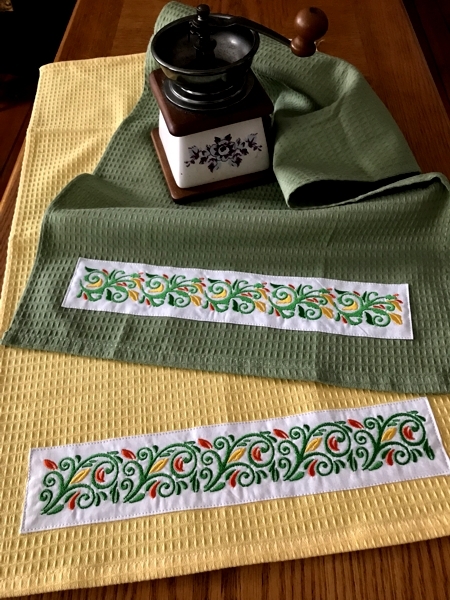 This tutorial explains how to embellish the items with embroidery without embroidering directly on them. For this project we used designs from the Baroque Border Set. The Baroque Border Set contains 8 files. 4 files feature long designs, and 4 files feature matching short designs. Measure the width of the towel. Ours is 15" wide. 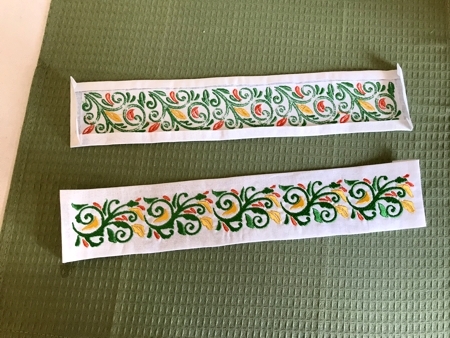 So we decided to embroider a long design once and a short design twice. If you need a longer or shorter border, you can use more or less designs. Fold the piece of fabric in half and lightly press to mark the central vertical line. 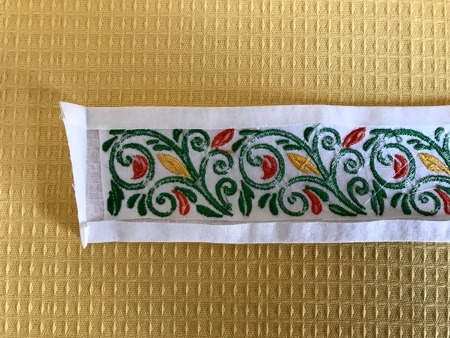 You can also mark this line with chalk or disappearing fabric marker. Stabilize the fabric with light-weight cut-away stabilizer. 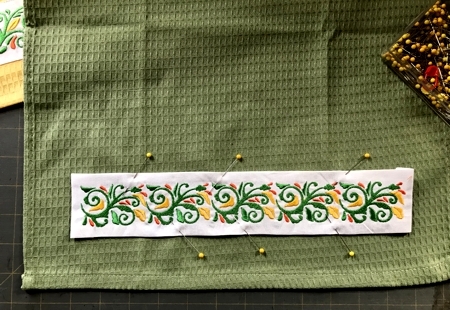 Using the frame grid, hoop the fabric so that the marked line on the fabric coincides with the central line on the grid. Upload the file with the long design into the machine and embroider it. Re-hoop. The central line on the fabric should once again coincide with the central line on the grid. Embroider the corresponding short design twice. 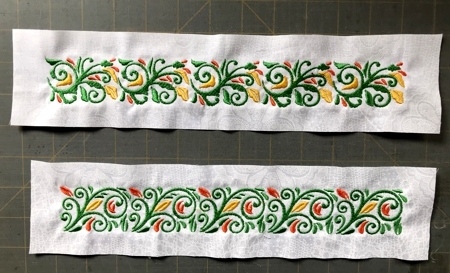 After you are done with embroidery, press the working piece and trim the stitch-out leaving 1/2"-3/4" margins around the embroidery. Cut away the excess stabilizer around the stitch-out. Fold the raw edges back about 1/4" - 3/8" and press them. You'll get an embroidered strip. Pin the strip to your towel, leaving equal margins on the left and right sides. On your sewing machine, topstitch the strip to the towel as close to the strip's edge as you can.